This time of the year, I’ve got more plants in the tub than people! I’ve ordered lots of trees and bramble fruits for our orchard this year; I keep seeing these things bringing higher and higher outrageous prices and decided THIS year I’d get the orchard booted up. Okay, but every day now, I’m getting a box or plastic bag full of trees and plants! The best have come from Starks and Fedco, although I did get some AWESOME Hanson’s bush cherries from Exciting Gardens, which I didn’t expect. The worst were from Gurneys, arriving four weeks ahead of decent planting time here in northern Minnesota, when we had two feet of snow on the ground…and another two feet three days later. I’m sure those folks have internet access and could see weather patterns across the country. But evidently, they don’t care. So no more Gurneys orders for me! I’ve got almost everything in, the day it came or as soon as we had DIRT showing. So far, so good. 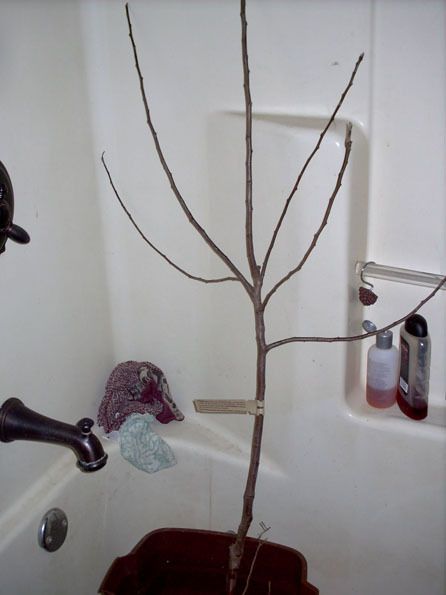 I always soak the trees/plants a couple of hours before I plant them, in case they’re partially dehydrated, so I’ve got a mop bucket in the tub full of fresh water…and trees! I’m so excited and our weather’s helping out with nice warm days and rain periodically. Wish us luck! I was looking at another homestead blog and the topic of health insurance was mentioned. Do you have health insurance? Through the state or paid for by yourself? This other blog stated thay were a homesteader and used the state health insurance program. Is this really self reliance? Depending on the government and fellow tax payers to pay thier insurance? My opinion is no, this is not self reliance, it is using your neighbors to pay your way. I am a very conservative person and do not believe in anyone paying my way. I work hard for a living and don’t think my hard earned money should be given to someone else. Just curious as to what your thinking was on this issue. In a way, David and I are lucky. As my late husband, Bob, had a 100% service connected disability through the VA (agent orange), David and I receive survivors’ benefits which include CHAMP VA insurance. I don’t feel this is putting our health care on our neighbors, as Bob died as a result of his service in the Marine Corps, in Vietnam. It’s lucky we DID have the insurance, as my cancer surgery and treatment, and last summer, David’s bout with flesh eating bacteria would have really, really hurt us financially. There is a Christian share-pay type of medical help, where thousands of people are banding together to help share the burden of each others’ medical care. If we did not have health insurance, I would seriously consider joining this group. www.medi-share.org It is not an insurance company, but a co-op of sorts. I just wanted you to know how much your articles mean to me and how much help they have been since we have got our own 10 acre with pigs goats and chickens and horses. Where can I buy hypodermic needles for my medical kit, like you suggest? I will be cooking for a crowd and making a large quantity of chili, which will include pre-canned kidney beans. I would like to can the leftovers. Do I still process the chili for the longest time for pints and quarts? I have the same question for soups with meat, meat pasta sauces, stews, etc. Usually, I freeze these, but now that I finally have a pressure canner, I would really like to use this method. In the past week, I’ve had 2 chickens lay tiny eggs, almost like a bird’s egg. We broke one open to discover there was no yolk, just the white. Do you know what might be the cause of this? One chicken was a bantam, and the other an Australorp. Both are around 7 years old, but still lay pretty regularly. Jackie, my wife and i love your articles and we have been advid readers since American Survival Guide went belly up and then switched to BHM. My question is what is the best way to prepare rice for long term storage. We are an Asian house and want to store approx 500 pounds for emergencies. To answer the question about canned bacon, of all the places to look try www.canned-bacon.com/. It seems it will soon be in production in Ohio. Thanks for all the knowledge you share. Not really a question, but a comment on your article on first aid/medical supplies in the latest BWH magazine. You suggested keeping a supply of antibiotics on hand and that your doctor might write a prescription for you to do that. No need to see your doctor! Many antibiotics that are prescription for humans are OTC for some veterinary uses. Not only can you save a trip to the doc and a bill from the doc, but the antibiotics used in veterinary practice are often purer than those used for human practice. Many of the antibiotics are OTC for fish, and fish are very sensitive to some of the additives and binders that are commonly used for human drugs. I’ve used Foster & Smith and can personally vouch for them, but you might be able to find them even cheaper from different sources. I’m not a doctor and don’t even play one on tv, so I’m not going to recommend that anyone use a drug for anything other than its intended on-label use. But you can do with the information what you will. This may be a wacky question, but can you can butter from storebought butter? I normally freeze mine, but was curious if it could be done. If so, would love to have the processing time and directions. Its Christmas in April when those trees and bushes start coming in, isn’t it? I’m expecting mine any day now (I ordered late, had to wait for my tax refund in order to pay for them). I’ve had too many bad experiences with Gurney’s. Seeds from them do fine, but every live plant I’ve ordered from them has always been DOA.